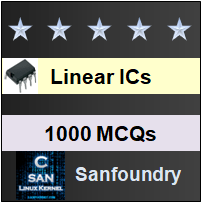 This set of Linear Integrated Circuit Interview Questions and Answers for freshers focuses on “Operational Amplifier Internal Circuit – 4”. Explanation: The current gain in Darlington pair differential amplifier is given as β=( IC1+IC2)/IB1. 3. In the circuit shown, find the overall current gain? Explanation: From the circuit given, IB= IB1 = 5.6µA. IE1= IB1+ IC1 = 1.43mA + 5.6µA = 1.435mA. => β1 = 1.43mA/5.6µA= 255.36. Therefore, the overall current gain, β = β1 × β2 = 255.36 × 1742.16 = 444878. Explanation: Input resistance of the order 1012 Ω is possible with JFET at the input stage of differential amplifier. 5. 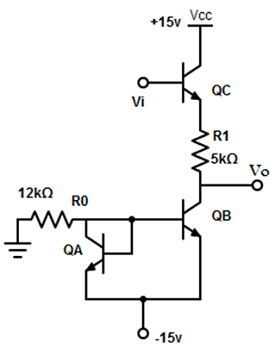 Why active load is used in amplifier to obtain large gain in intermediate stage of amplifier? Explanation: To increase gain usually large collector resistance value as gain is proportional to load resistor. However, due to limitation of maximum value load resistor, active loads are used in amplifier to obtain large gain in intermediate stages of amplifier. Explanation: Current mirror has DC resistance (order of few kΩ), as quiescent voltage across it is a fraction of supply voltage and current in milliampere. 7. What is the equation of load current for a differential amplifier with an active load? Explanation: Load current entering the next stages of amplifier is the sum of individual load current, which is given by IL = IL1+ IL2 (Since only two input voltages are given). = gm×( Vin1 – Vin2) = 0.065 Ω-1×(4.9v-2.5v) = 0.156A. 9. 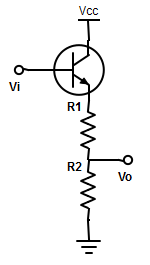 Calculate the VI – VO for the level shifter shown in the figure (Assume identical silicon transistor and very large value of β). Transistor QA and QB form current mirror. 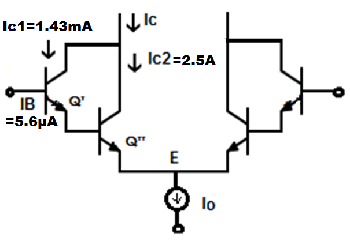 Explanation: Since the transistor QA and QB form current mirror, ICA= ICB = I. The shift in level is given as VI – VO = VBE + I×R1 =0.07v+1.19mA×5kΩ =6.65v. Explanation: As gain is proportional to load resistor, large resistance value is required. Due to limitation mentioned, it is neglected. 11. What is the need for level shifter in operational amplifier? Explanation: Because of direct couple, Dc level rises stages to stage and tends to shift operating point. This limits output swing (Voltage). Explanation:The limitation in the amplifier is that , the output voltage remains zero until the input voltage exceeds cut in voltage VBE= 0.5v, which is known as cross-over distortion. Explanation: In an Output stage amplifier, due to cross-over distortion output voltage produces input voltage is greater than two times of cut-in voltage which is equal to 1v. Explanation: The output taken at the junction of R1 and R2 increases the voltage shift. However, the disadvantage is that, the signal voltage gets attenuated by R2.